Texwipe, the first name in cleanroom wipers. We created the world's first lint free wiper in 1964 ... and the contamination control industry. 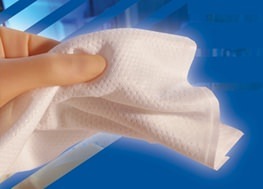 Texwipe offers a variety of clean room wipes: dry wipes, pre-wetted or pre-saturated wipes, non-sterile and sterile wipes, industrial and laboratory wipes to meet the strict requirments of pharmaceutical, bio-medical, and medical device, semiconductor & microelectronics, healthcare (USP <797> and USP <800>), aerospace, aviation & defense, laboratory, food, print, and automotive industries. Is "lint free wipes" still a valid term? Read here what lint free really means.